This Overbust is truly Romantic, shown with the pure white blouse, a flowing overskirt and a cotton circle skirt. You will be a vision of Loveliness! 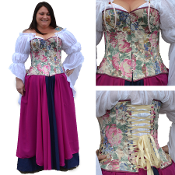 Blouse and skirts are one size fits most, please choose your corset size.